Korbin the Mad is the Lord of House Dunamai, a noble house centered around the Dunamai family. He is unmarried and currently has no heirs. Korbin suffers from an unknown insanity, as does much of his house; he claims madness attracts madness, and so House Dunamai grows. The Dunamai name was not always a noble one; Korbin spent much of his life in combat, once fighting under the banner of Muxlovia, as a personal friend to Sir Peregrine, the Paragon of Pirates. He was among the original warriors that claimed the realm and began Muxlovia, along with dear friends Jackal, Sear, and Crow, all of whom died in battles defending the realm. In time, Korbin seperated to independant territory, raising a band of warriors himself to fight alongside Muxlovia on the field of battle. Most notable of these warriors was Croc, a young boy with a natural gift for warfare and a sharp ability to learn. He was to become Korbin's protoge. 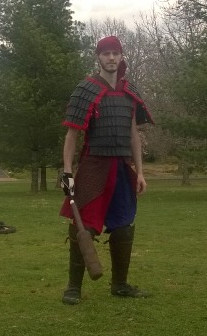 During these times, Korbin developed a rivalry with another warrior of Muxlovia. The man was called called Chimera, and he trained heavily with Korbin in the days of origin. The two often struggled with one another, their rivalry festering, until Korbin saw Chimera as a nemesis. It was also in these days that a close friend in Muxlovia named Geo gave him a special gift. It was a mace, crafted in a unique way, specially designed for the features Korbin preferred in a weapon. It was called Tour. At the time, Korbin preferred blades, but the mace saw some use early on; eventually, Korbin liked its use enough to modify it himself, adding a pronounced spike to the end of it, allowing him the ability to thrust. Not long after recieving Tour, Korbin retired to a local tavern to enjoy a cut of cheese and a mug of mead. Soon he found himself enraptured, however, when a beautiful young woman entered garbed in black linen adorned in coins. Fascinated by her style, he was about to take the first bite of his cheese when a trio of French warrant officers entered. Korbin watched as they approached the girl, who had little time to evade them and fell trapped to their numbers. But when one of them struck her for struggling against them, Korbin rose from the bar, a wedge of cheese in his hand, and demanded that they not manhandle her. The Frenchmen, fearing his intervention, told him to bugger off; the chief warrant officer threatened steel. Putting the cheese wedge aside, and covering it with a wooden bowl so as not to splash it with blood, Korbin stepped forward. The three Frenchmen drew rapiers, and Korbin pulled his mace from his belt. The patrons of the bar, and Karma herself, were then witness to a violent display of self-defense, as the Frenchmen struck first. After retrieving his untouched cheese and vacating the tavern full of horrified witnesses, Korbin bade the woman named Karma follow him and explained that the French had no authority in Muxlovia, or anywhere beyond their land-- and barely even there. As his preference for blunt weapons grew, he began to craft his own weapons. After much study, he created two matching maces, sisters in war; one was called Ping, which he kept as a secondary weapon, made in the likeness of his newfound lover. The other was named Raz and was given to his apprentice, Croc. The band of warriors Korbin raised also saw the return of an old and lifelong friend of Korbin's, a barbarian named Borick. He was a skilled warrior, uncharactaristically patient for a barbarian, with skin thick as steel and a will that would not bend. He often helped Korbin train the fighters, offering a second perspective and some insight into the aspects Korbin struggled with. In time, Korbin, Borick, and Croc were drawn apart, each called elsewhere to the next chapter in their lives. Korbin and Karma were wed just before his departure. After showing prowess in local skirmish beneath Muxlovia's banner, Korbin was approached by an emissary of the Uruk-Hai known as Demox. The man asked Korbin to fight with them in the upcoming war that was brewing in the north. Korbin felt no allegience to another militia at the time, and accepted the position; it was only later that he learned his companion Peregrine had joined the garrison of the Clan of the Hydra, under the same banner of the Iron Crown. For two campaigns, Korbin fought alongside Demox and the Uruk-Hai, as well as Peregrine and the Clan of the Hydra. But when the war was done, Korbin felt his time with the Uruk-Hai was through, and took his leave from them. After a season, word reached Korbin that his nemesis Chimera had followed Peregrine to the Clan of the Hydra as well and had become a squire. On some level, Korbin felt a pride in his brother of Muxlovia, knowing that their fights and training had paid off for him. He hopes, somday, that he will be squired as well, and can again fight with Chimera as equals. Just as war has claimed many lands, so too did war claim the sea, and Korbin followed his family heritage by taking to the waters. Not long after his own wedding, he took charge of an independant vessel, the Riggans, and began assaulting tradelines of hostile territories, returning to port only to sell his spoils. Some say he killed too many. and that the spirits of those that died at his hands haunted his dreams and addled his mind. Others say he spent too much time beneath the pounding sun on the sea, or that he drank the salted waters. Others still claim he communed with the Mad God, trading his sanity for blessing. Whatever the way, during his time on the sea, Korbin began to lose his grip on reality. His crew tells tales of his fickle behavior, and of how many of them did not know he suffered madness because of his calm demeanor. It was the small things that alluded to his insanity, such as demanding that the ship sell its food and stock no less than ten kinds of cheese and lettuce, and nothing else. But in combat, they claim he slipped loose and became a true madman. He traded his blades for clubs and cudgels, saying he preferred things smashed than cut, and many of the crew followed suit. In time, Korbin's ship struck soundly in the moors of Arnor, a land Korbin had never seen before. He was welcomed grandly indeed; it seemed his service in combat on the sea had gotten the attention of some nobles, and, with the permission of High King Angmarth, Korbin was given land in Arnor and made a minor noble. He sailed his wife Karma into his new abode, and grew to love his new life. Gradually, he began to surround himself and his family with warriors and friends that would fight under the banner of his house. At first, it was only he and his wife. He had never been nobility before-- the concept of a noble house was foriegn to him. But it began to grow when, one day, a slave trader crossed over the Madlands. Korbin saw the campfire just behind the treeline, and dispatched his hired guards at once. The band of slavers were transporting high-profile female slaves to port on the far side of the Madlands, for to sail for another land. Korbin had no qualms with their trade, but when it was discovered that the slavers carried with them cheese, Korbin demanded that they pay the recently-instituted cheese tax, yielding forth twenty percent of their cheese to him. The slavers gave to Korbin's men twenty percent, but when Korbin recieved the cheese, he discovered that the slavers had given him the oldest, dirtiest, moldiest cheese of their stock. The guards returned and slaughtered the slavers, taking all their cheese and slaves. Over time, Korbin sold or traded all the slaves, save one. She was called Ancilla. She had caught Korbin's attention because each slave bore with them a scroll of information, and her scroll showede her crest: a mermaid armed with a sword, riding upon seven stars. Because of Korbin's life at sea, he saw the mermaid-- and thusly, Ancilla herself-- as a good omen, and decided to keep her as his own. She soon became considered a member of the family. Currently Korbin and all he can spare from House Dunamai train hard with the warriors and soldiers of Arnor to prepare for battle. He has sworn fealty to High King Angmarth and has committed all available forces of House Dunamai to Arnor. Wherever Arnor is found on the battlefield, so too will be found Korbin the Mad and House Dunamai. The Dunamai name is known for its heritage of faring the sea. The family crest is three sea scallops on a background of black, sometimes adorned with a chevron to indicate military service. When the Dunamai name was made noble, with Korbin Dunamai made lord of a small territory soon thereafter made known as "the Madlands", the crest was reborn. The new coat of bore three sea scallops on a field of black, with a quarter of scarlet and purple cheques. 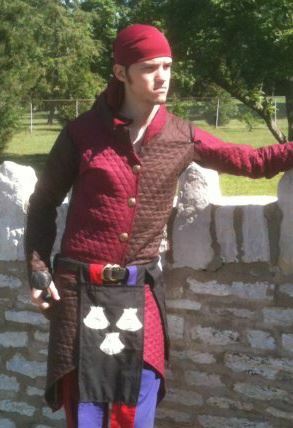 The charges were chosen to represent Korbin's sea-faring history; the choice behind the colors is a mystery, but has sometimes been compared to a jester's motley as a jab at Korbin's reputation of madness. Korbin's father, Tilden, was an honorable raubritter just beyond the outskirts of Muxlovia who seized and maintained power and used it to fight unfair tolls and taxes imposed by everyone from guilds to other raubritters. 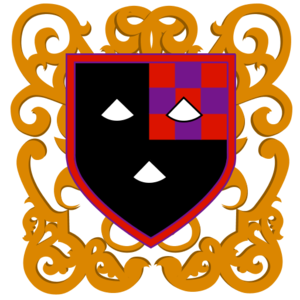 Because raubritters were considered merciless criminals, when he chose his path, he also chose a new heraldry as would a noble or a knight, so as not to dishonor the heraldry of the Dunamai family. His choice, divided by a diagonal split, was a black equine bust on a field of gold in the top right, and a bare gold field opposite. This was often portrayed on a black-bordered kite shield much like the one he carried. Eventually Tilden was killed in battle and his small empire dissolved, but only after a lifelong campaign of sailing and fighting against unmanaged injustice. Korbin sometimes flies his father's heraldry alongside his own to show respect to his heritage, and to honor the mission his father gave his life for. Korbin, real name Nathan Strickland, began fighting in 2003 in his teens. He was a student and friend of Peregrine, who discovered Belegarth and shared it with him. Along with a few other friends, Korbin was among the original members of Muxlovia, founded by Peregrine sometime around 2003 in Romeoville, IL. Until about 2007, Korbin religiously attended practice, and often fought regularly during the week. But as he grew up, he was forced to get a weekend job, making him unable to attend normal Saturday Muxlovia practices. As such, he was forced to set up his own group to practice during the week. He knew several others in his neighborhood that were interested, and so he taught them the rules and began building loaner gear. Over the course of the next two years, the fighters became well-known in the small neighborhood of Crest Hill, IL, and spectators were regular. The group that began with about four people had branched to about ten dedicated fighters. The best of them was called Croc, who had a natural skill and had been eagerly learning from Korbin all he could. A few of the fighters occasionally visited Muxlovia practice, but it was rare that everyone was available on the weekend to attend. In 2010, Korbin moved away from the group, to a small town in Kentucky. He was too far away from any of the nearby realms to attend practice, and for close to two years, he was unable to fight. For this reason and others, he and his wife chose to move closer to family in St. Louis, MO, in late 2011 and became a part of Arnor. After impressing a recruiter at a Muxlovia practice in 2008, Korbin was invited by Demox to join the Uruk-Hai. He fought with them at Oktoberfest 2008 and again at Spring Wars 2009, but once he moved to Kentucky, he lost all contact. After returning to Belegarth to fight with Arnor, he chose not to pick up his association with the Uruk-Hai, deciding to spent more time working with House Dunamai and on his connection to Arnor. Korbin has trained with many kinds of weapons. 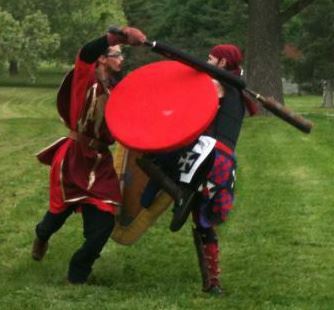 He mostly prefers round shields, generally 2'-3' in diameter, as well as short top-heavy maces with stabbing tips. Of these maces, he favors two; his primary, Tour, and a secondary, Ping. He has also trained with a spear, combined with a shield on his back (a method he refers to as "turtling"), and a sidearm for close encounters. He is also practicing his archery. Unless arching, he will always have a javelin, and has learned to become respectably accurate. On the field, he often chooses to be the flanker, generally preferring to go alone as a sole distraction, especially when equipped with missile weapons. He enjoys working in coordination with a larger group, but during smaller skirmishes, he often acts solely unless given an appointed task. As a fighter, Korbin relies on agility, and the ability to overwhelm his opponant with fast, extremely aggressive attacks. Brief accurate single swipes are rare but sometimes used to keep his opponant guessing. In times when total aggression is not appropriate, he prefers to look for an opening and wait for his opponant's move in order to counter-attack. Although slight in weight and stature, he is as physical as any fighter, not afraid to use his shield or his own body as much as his mace. Korbin generally makes all of his own gear, garb, and armor. He has accumulated a large enough arsenal to outfit a small realm. Not listed: Various season openers, closers, and mini-events that include Muxlovia, Wolfpack, Loderia and Numenor. This page was last modified on 24 June 2014, at 11:23. This page has been accessed 25,545 times.